I boarded the 450-passenger boat on the first day of spring with my 5-year-old daughter. We got lucky with a warm, clear day, and I couldn’t wait to relax on the open-air top deck. Everything about the experience is authentic to riverboat tradition, including all staff dressed in black and white “captain” uniforms. Located downtown between the Olgiati and Market Street bridges, the boat is docked at Pier 2 – a former casino boat complete with smokestacks and pressed tin ceilings. It remains stationary, but still hosts its fair share of events on its Grand Chandelier Deck and features the 3rd Deck Burger Bar sitting 40 feet above the beautiful Tennessee River offering outside patio or indoor seating. 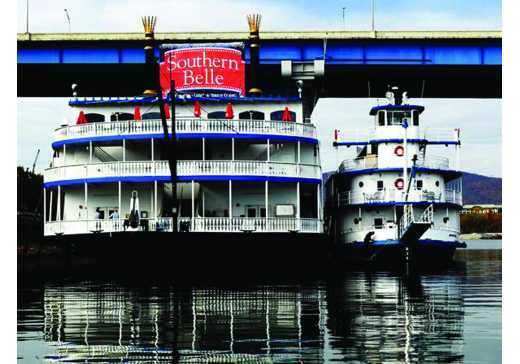 Built in the mid-80’s in Hales Bar, Tennessee, the Southern Belle holds up to 450 passengers on its three decks. We had a little less than 200 on our trip, and we were all welcomed aboard by the cruise director and crew for the next three hours.The season begins in February on Saturdays and high season runs mid-March until December. Normal sightseeing cruises are less than two hours, but they don&apos;t begin on a regular basis until high season, which runs May until December. 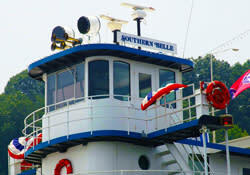 But the Southern Belle runs seasonal cruises every month of the year except for January, which is still open to private charters for groups of 40 or more. 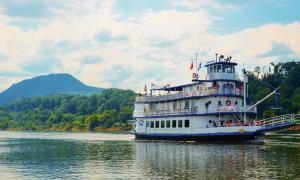 We booked the Spring Canyon Cruise, which runs on weekends in March and ventures to the mouth of the Tennessee River Gorge –also known as ”Tennessee’s Grand Canyon.” Most of the trip was narrated by Hubert Gray, a national historian on all things Chattanooga – especially related to the river. During our cruise, I learned all sorts of fascinating facts such as there is no “Signal Mountain.” Signal Mountain is the name of the city atop Walden’s Ridge, which likely got its name during the Civil War when it was a strategic place to send smoke signals from its bluffs. I also learned the rocks below Baylor School are approximately 500 million years old, and that the vast barges moving up and down the river hold freight equaling 61 tractor trailer loads. The fact that these behemoth containers coexist peacefully with kayakers and fishermen is a perfect example of the city’s versatility. 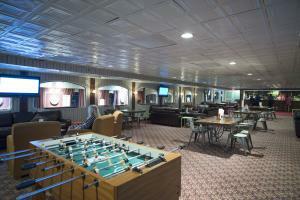 The cruise began on the lower deck, all of us seated at about 40 tables. Up front, Riverboat Tony entertained us with live music as we enjoyed a hearty buffet of chicken breasts and roast beef, buttery rolls, green beans and potatoes. When we’d eaten our fill, we explored the rest of the boat, settling in the sunshine on the top deck. There were snack bars on every level selling candy and popcorn as well as beer and wine. As we neared Moccasin Bend, our narrator Hubert grabbed his microphone and joined us up top, joking with the kids and pointing out sights. When my 5-year-old&apos;s attention span ran out, we meandered up to the bridge to watch the captain steer the ship. While it felt like we were moving at a fast clip, he informed me we were going about 9 mph. After our time with the captain, we returned to the lower deck for several rounds of Bingo. My daughter didn’t win the stuffed unicorn prize she was eyeing, but I made up for it later at the Pier 2 gift shop – the largest in Chattanooga. The Tennessee River has always been one of Chattanooga’s best assets, and seeing it from a different perspective made me appreciate it even more. I wanted to know what it might have been like to travel during the heyday of river boats, and the Southern Belle certainly didn’t disappoint with just the right mixture of history and entertainment.